This article will explain the different steps you may take to migrate your email to G Suite. These include the basics of using Google's migration tool to migrate your email from a mail server using IMAP and manually migrating using an email client to transfer email from an IMAP server to G Suite. While it shouldn't take that long to click through the steps detailed below, please be aware that the time needed to complete the actual data migration can vary. This will be dependent on the amount of data in the mailbox that is being migrated. The steps for migrating email to G Suite contained in this article are provided as a courtesy. Please take a moment to review the Statement of Support before beginning. For help migrating from a MS Exchange or 365 account, you will want to refer to Google's article here. 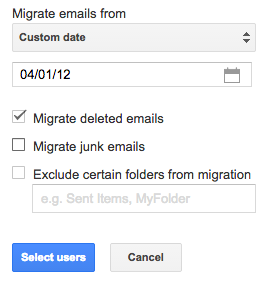 You may use the steps provided below to migrate email using Google's migration tool. If your domain does not have an SSL certificate, you will not be able to use this migration method and will need to use the manual migration method. The only exception to this is for our Grid customers. If you are migrating mail from our Grid service and wish to use the migration tool, you may use your email access domain to migrate your email. Please review all requirements listed below before you begin using Google's migration tool. If you haven't already, create an account in G Suite for the user you want to migrate email to. Once the account exists, return to the G Suite dashboard while logged in as a Super Admin. From the dashboard, select Migrations. To begin your migration, you will need to choose the type of server you are migrating from. Because (mt) Media Temple email uses IMAP, we will be choosing Other IMAP server and the IMAP protocol. Next, you will need to input the name of the mail server you are migrating from. If you host your email with (mt) Media Temple and are unsure of this information, you can find your email server information in your Server Guide inside the Account Center. To help avoid issues, it is recommended that you use your access domain. Once you have input the server name, you will need to enter the credentials for the mail. This is typically the email address and password for the account you are migrating from. Now that all of these fields are complete, click on Connect. Next, we will choose what content we wish to migrate. When you have selected your preferences, click Select users to proceed and select the user(s) you wish to migrate this email content to. Lastly, tick the checkbox to the left of the user you wish to migrate to and click on the start arrow at above the users. If you do not see the credentials for your old email user, you may need to add them here as well. The migration process is now begun. You will be able to return to the Migration panel of G Suite to see the progress of your migration. Please keep in mind that the time it takes to complete the migration will vary. Once your email migration has reached 100%, it is finished and you will now be able to log into the Gmail account for this user and access your migrated mail. After your mail is migrated your email, you can point the DNS MX records for your domain toward your new G Suite service. The steps below will help you migrate your mail manually. Please review all requirements listed below before you begin your manual migration. The server you are migrating from must support the IMAP email protocol. All (mt) Media Temple hosting packages can connect using IMAP. Create the same email account on your new G Suite account that you had on your old server. Use the same spelling and capitalization. The incoming server (or IMAP server) will be different for each account. You should use imap.gmail.com as the incomoming mail server for your new G Suiteaccount, and your access domain or IP address for your old server. With both accounts online, open up the inbox for the account that connects to your old server. Drag and drop messages from this inbox to the inbox for your new G Suite account. If you have a lot of emails, give the accounts a few minutes to finish syncing up. Once they're done, your old emails will be in your new G Suite email account. If you are using Media Temple's nameservers, you can also use our automated Point Mail to Google tool in the Account Center.